Hello! I’m sorry I’ve been very slow in replying comments, time is passing way too fast! I am now resorting to blogging on my way to work… so I’ll have to squeeze in time here and there to reply all your lovely and sweet comments. Thank you all so much for your support, I am truly touched and amazed by how loved this blog is. Weekend’s coming up, have a fun, rejuvenating and exciting weekend ahead! And what do we have here? It’s another cake recipe! Hope you all aren’t getting sick of cake recipes… This time it’s a very light, delicious, lemony and nutty breakfast cake for the Bake Along hosted by Joyce from Kitchen Flavours, Lena from Frozen Wings and Zoe from Bake for Happy Kids. I made 1/2 a batch from the original recipe, reduced a little bit of the sugar and increased the amount of lemon zest. I used 3/4 lemon’s zest instead of the 1 teaspoon stated (for 1/2 of the original recipe) – and it gave the cakes a very strong lemony taste, which makes the cake extra refreshing and tasty in my opinion. The reduction of sugar gave the cakes just the right amount of sweetness, though I find the taste of honey very subtle (maybe it’s the quality of honey I used?) I also baked them in mini ramekins instead of one whole cake – just because they are cuter! 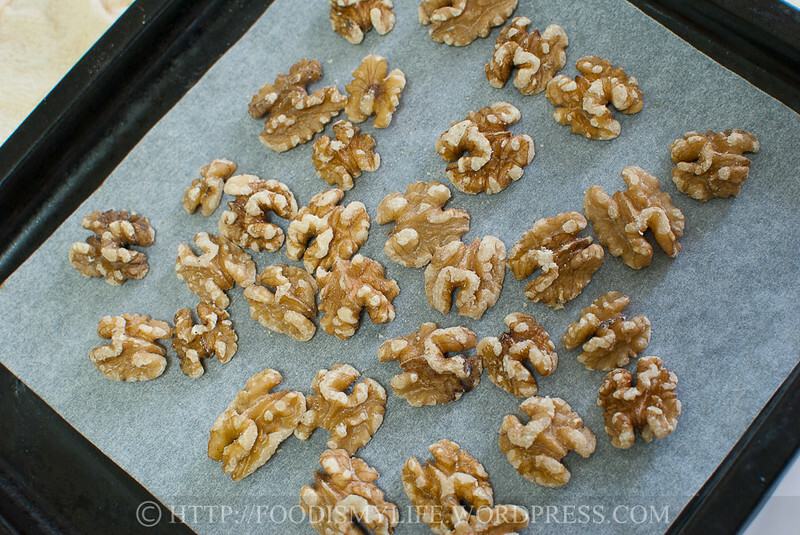 Start by preheating the oven and spread a layer of walnuts on a baking tray. Toast them until they are lightly browned. When the nuts have cooled down completely, place them in a food processor. 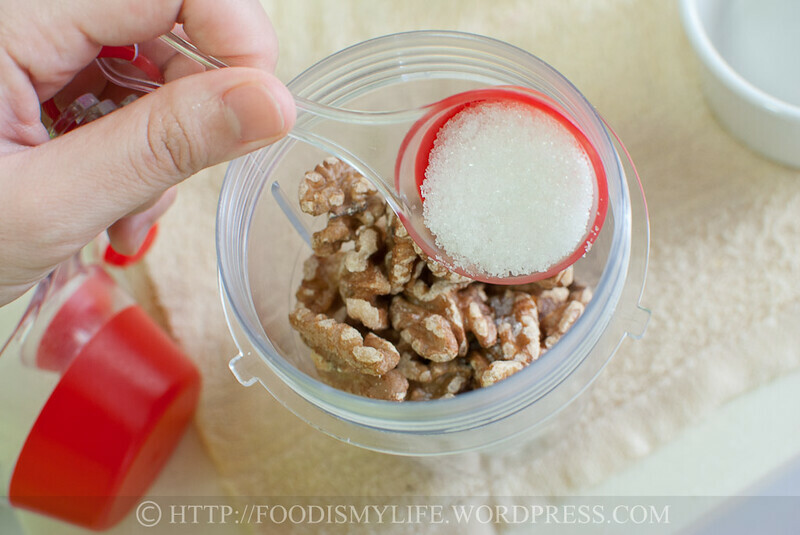 Add in some sugar to help absorb the oil released from the walnuts. 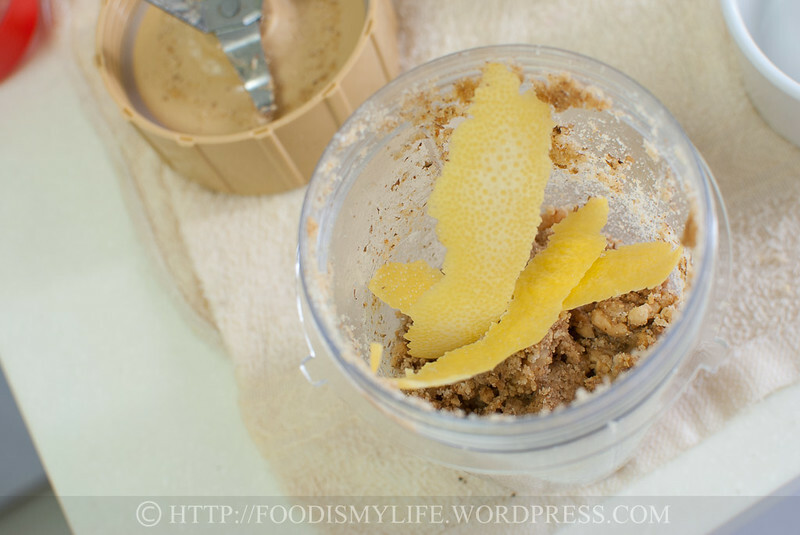 Process until it becomes a paste and add in lemon peel and process till fully combined. Add in the walnut paste and stir to combine. 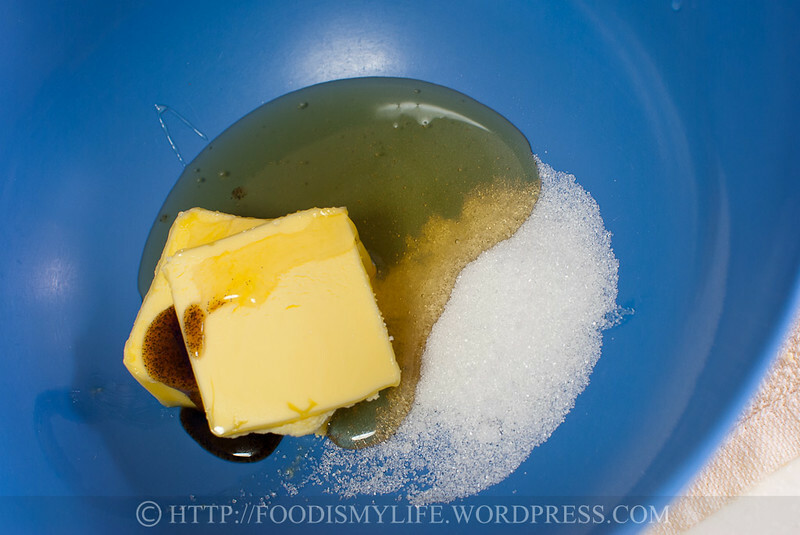 In a mixing bowl, combine butter, sugar, vanilla and honey. Cream until light, pale and fluffy. 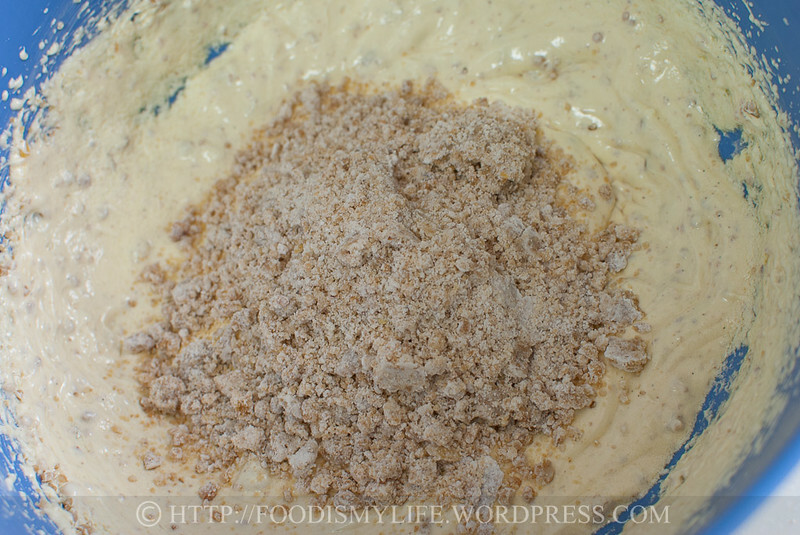 Add in the flour-walnut mixture in two batches, beating on low speed until fully incorporated. The batter will be of a very light brown colour. Divide the batter among 5 ramekins. I sprinkled some with some chopped, untoasted walnut pieces. Preheat the oven to 175 degrees Celsius. Butter 5 ramekins and set aside. 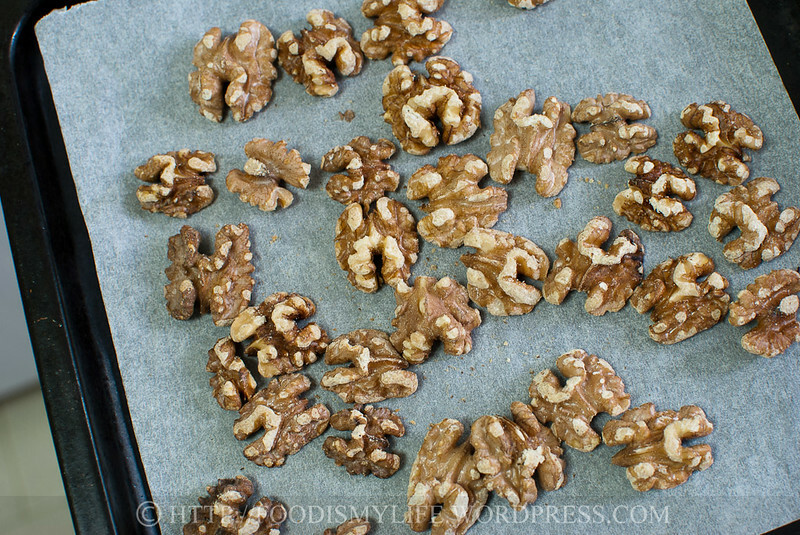 Line a 9-inch baking tray with parchment paper and spread the 70 grams walnut pieces in a single layer on the tray. Toast the nuts for 8 - 10 minutes until they are lightly browned and the whole kitchen is filled with a nutty aroma. Don't let the nuts burn! Remove the baking tray from the oven and set it on a wire rack to cool completely. 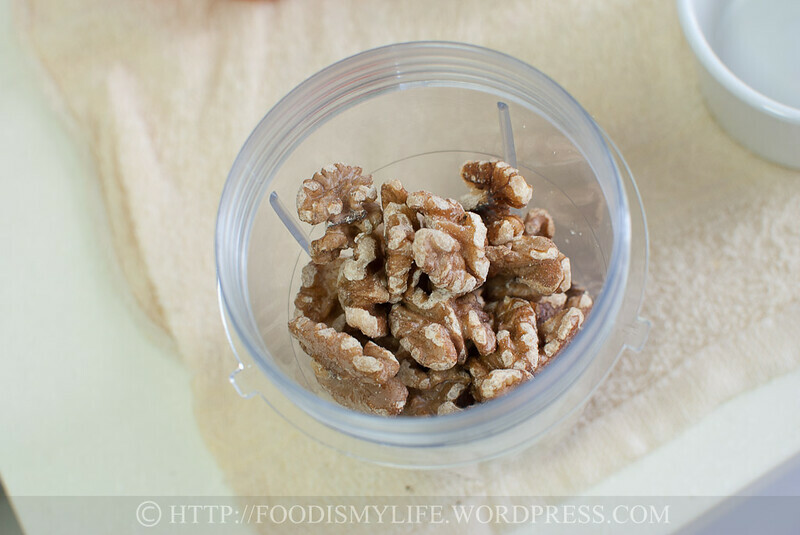 When the walnuts have cooled, place them into a food processor with 1 tablespoon of caster sugar and process it into a fine paste. Add in the lemon peel / zest and process it until fully incorporated. 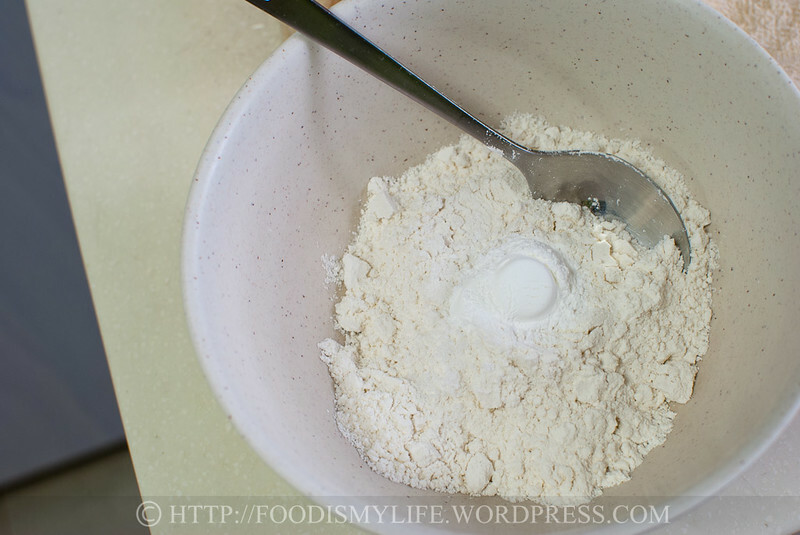 Place the flour, baking powder and salt in a small bowl. Stir to disperse the baking powder and salt thoroughly. Add in the walnut paste and stir the mixture together, pressing the walnut paste as you mix to remove as much lumps as possible. 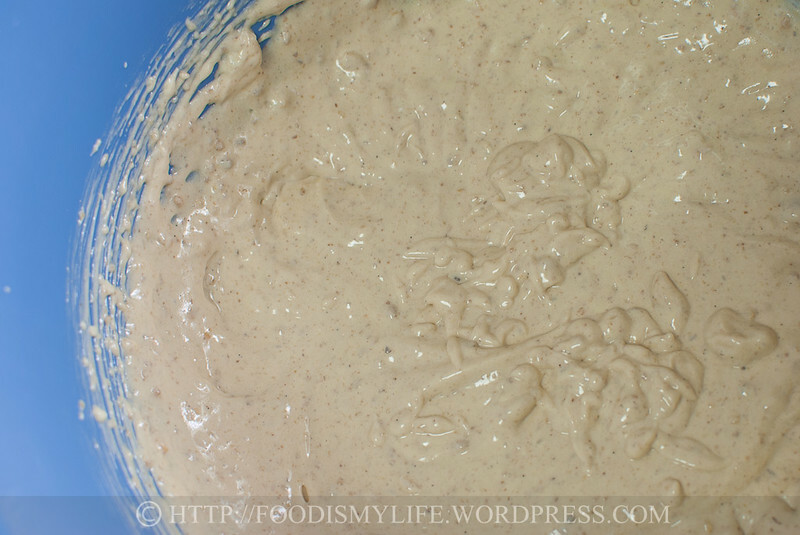 Alternatively, add the flour mixture into the food processor with the walnut paste and process until smooth. Place the remaining sugar, butter, honey and vanilla in a medium mixing bowl. 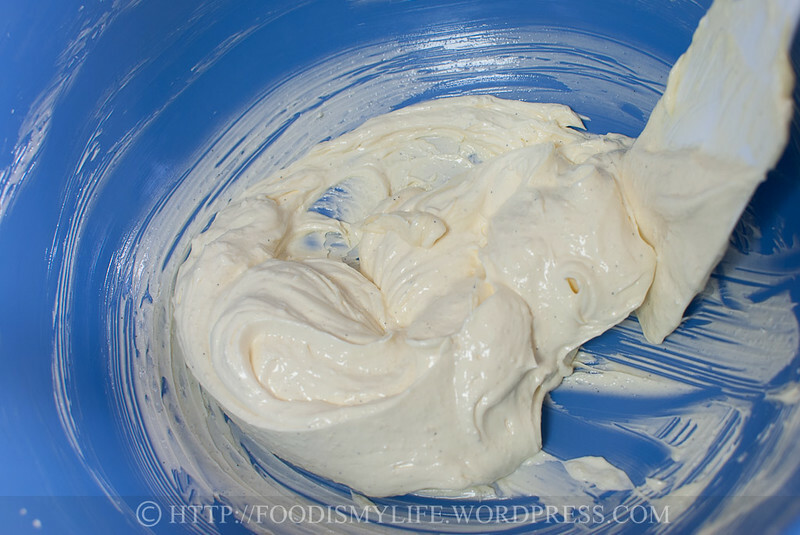 Cream the mixture until light and fluffy, about 4 to 5 minutes, scraping down the sides occasionally. Scrape down the sides and add in one egg. 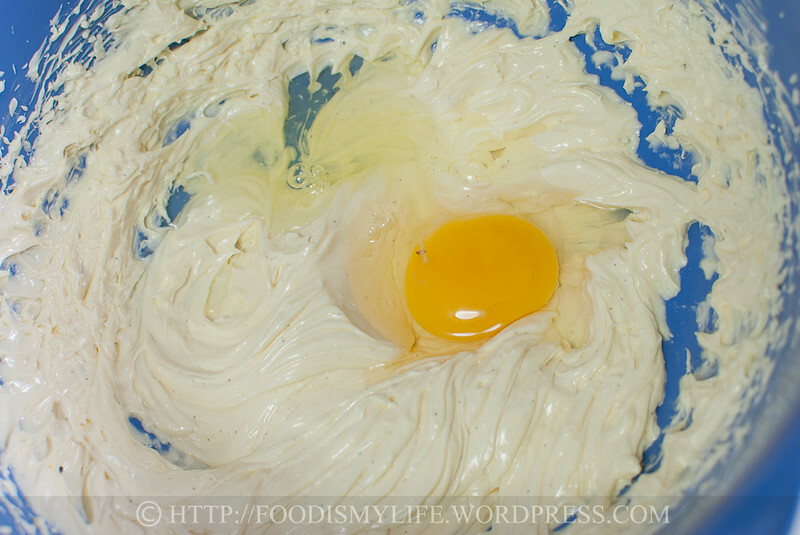 Cream for 1 minute, scrape down the sides and add in the second egg. Cream for 1 minute and scrape down the sides. 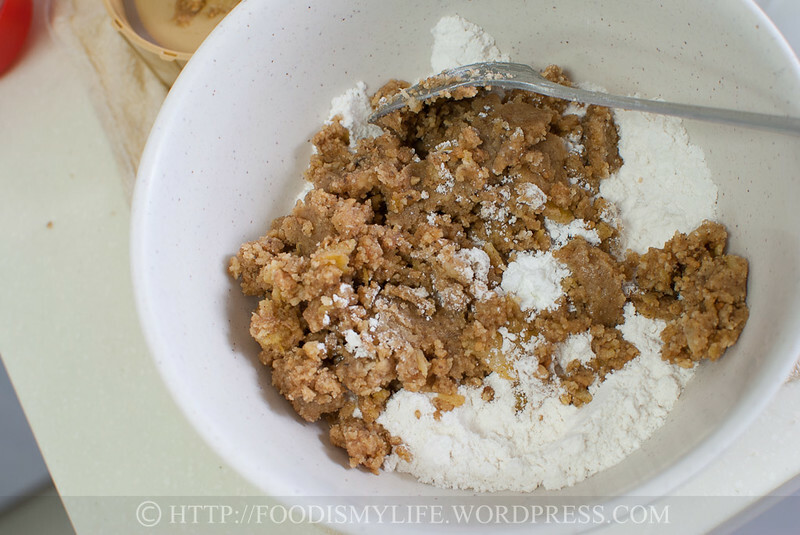 Turn the mixer on low and add in the flour-walnut mixture in two batches, beating until fully incorporated. The batter will turn a light brown colour. Divide the batter among the 5 ramekins. Sprinkle the chopped walnuts on top if desired. Bake for 20 - 25 minutes until the top is golden brown and a skewer inserted into the centre of the cake comes out clean. 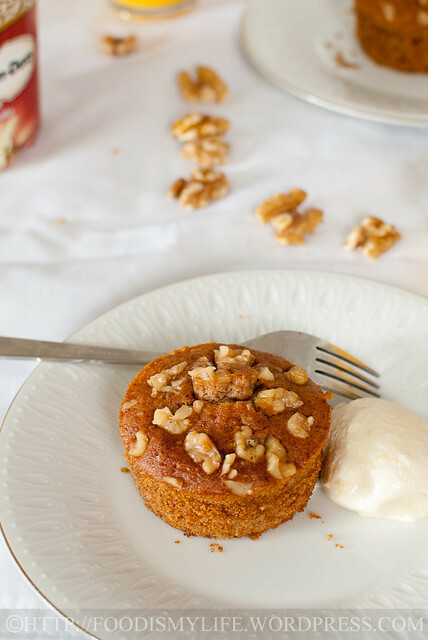 Serve the cakes warm or at room temperature with a dollop of whipped cream or a scoop of good-quality vanilla ice cream. To turn out the cakes, run a butter knife along the edges of the cake and turn it over onto a serving plate. Give the bottom a few light hits and the cake should come out easily. This amount of batter probably can make a small 6-inch cake. Double the amount to make a 9-inch cake. Grease and line the bottom of the cake tins with parchment paper so that it is easier to remove the cakes. Substitute the nuts with peanuts or hazelnuts for a different nutty experience. You can use salted butter instead of the unsalted one, just omit the salt in the recipe. Hi Mui Mui, thank you for stopping by 🙂 I’m happy to know a new foodie friend! Thank you so much for the compliments, take care! Thank you! I hope you made one for yourself! Hi Jasline, Know you from Bake Along event.. 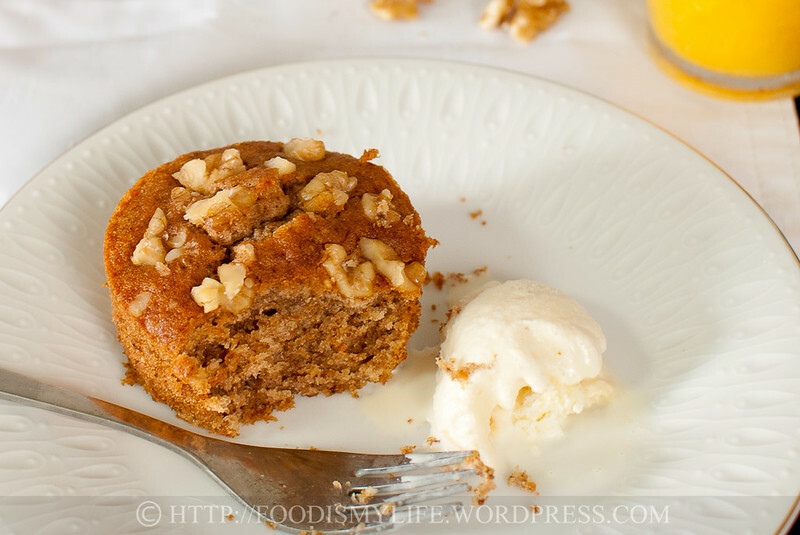 I like your pictures…step by steps making this honey walnut cake. Thank you for the compliments Angie! 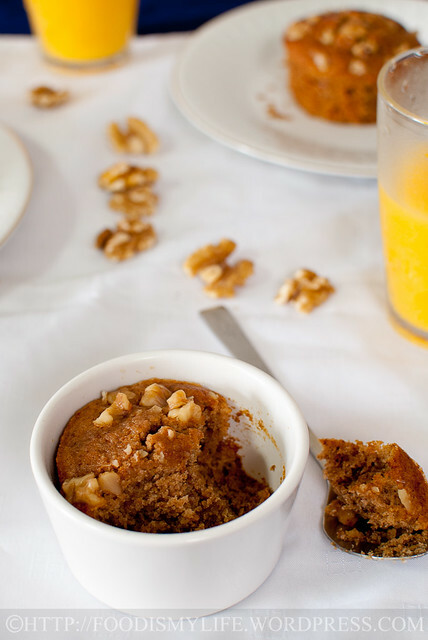 Yes it’s a great excuse to use my ramekins (they are often forgotten in my house… haha!) Glad you like it! So cute, I like how they were presented. Yummy looking too! 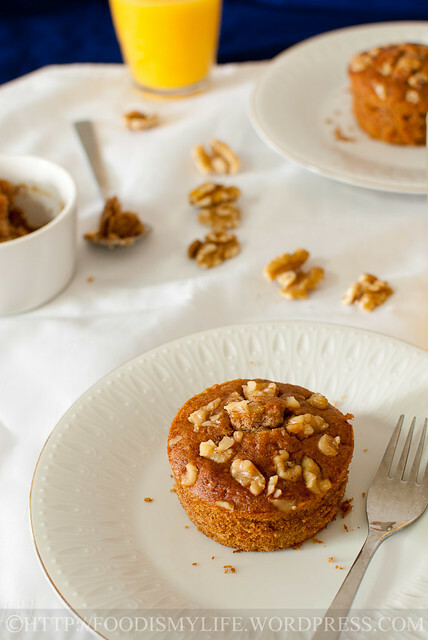 This is the second honey walnut cake recipe I’ve seen this afternoon. They both sound tasty, and I love how you’ve made them mini! Love individual servings…petite and delicious! I really like baking mini servings, and look for reasons to use my ramekin dishes! Can’t wait to try this recipe. Yum, I can already smell the toasting of walnuts! What gorgeous cakes for breakfast! I’m in love! These look amazing!! I wish I had one tonight! I love mini desserts! These look delicious! Ice cream will melt if I try to ship them over, so I’ll just ship you the cake and you’ll get the ice cream, okay? Hee 😉 Have a great weekend Villy! Me too! But I had to think of waistline…. haha. Thanks for visiting Brittany! Oh thank you Bobbi, you are so sweet, I am hopping over to see what’s cooking in your kitchen! Have a great weekend ahead! Thank you for the compliments, Chris! Thank you! Oh don’t worry, I’m cutting back on some cakes and cooking some savoury dishes the next few weeks. 😉 Glad you like the photos! Love the idea of baking them in ramekins. I agree its a very delicious cake with moist and buttery texture. hi jasline, beautiful mini cakes! i’m glad to hear that it turned out well for you. my cake turned out to be a little fudgy the first round due to the grinding of the walnuts but am glad that it turned out better the second time. It’s a very delicious cake that i really enjoyed eating. I would eat an entire plate of these! YUM! Your mini size looks very cute and good. I love eating cakes in their miniature forms too 😀 By making these cakes in smaller sizes, I realised that the honeyed surface will not get burnt so easily. 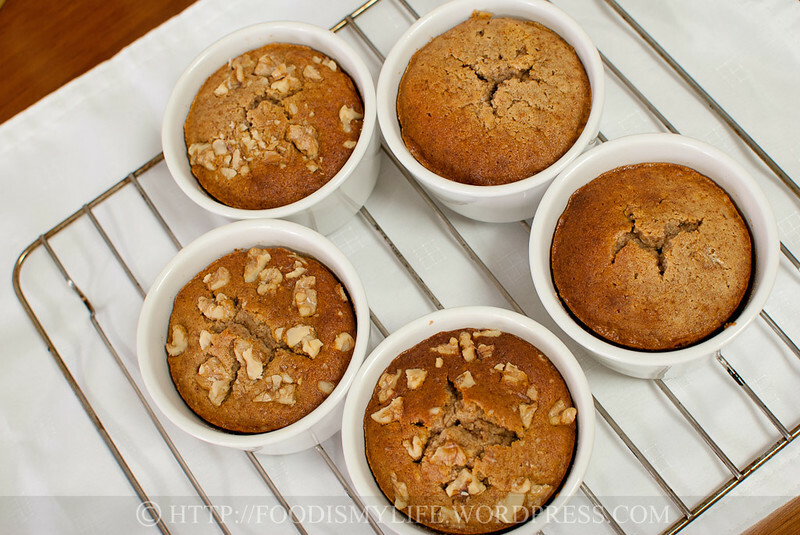 You are right that these nutty cakes are very yummy, nutritional and wholesome to eat for breakkie. Not really into cakes, nor desserts. Yet, especially as you’ve reduced the sugar, I’m loving the idea of these. Partly as I adore lemon and walnuts! Love your step by step photographs, btw. 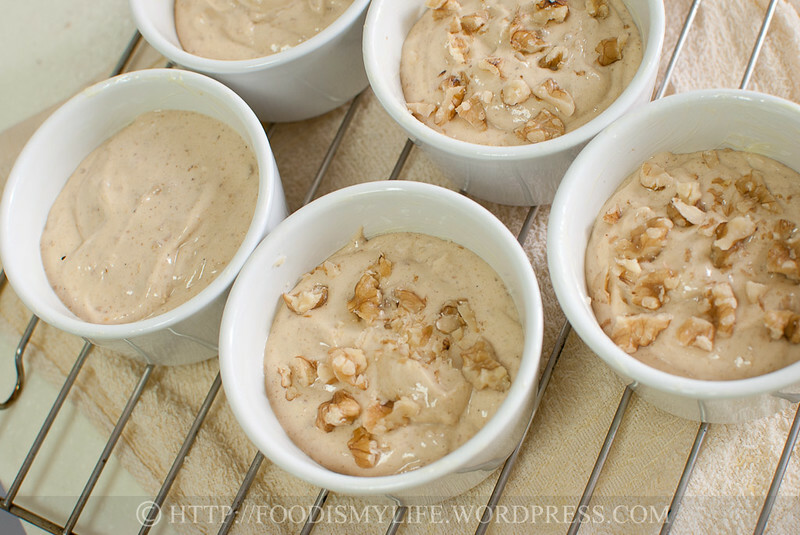 Love the idea of a walnut paste! These sound delicious and are the perfect size. I gotta try ’em. i was wondering about the beautiful shape of your cakes because the sides looked so straight.